I Never Thought It Would Come To This! I was raised to believe that all people living in the United States would be safe and secure in their homes, schools, temples or churches and businesses. But in the last few years it seems that is no longer the case. Especially for Jewish Americans. We have witnessed an upsurge in the number of violent acts either committed against Jews, such as the attack in Seattle which the killer was given a mistrial. Or the attack on the Holocaust Museum in Washington DC. Then there was the group of American Muslims who planned a series of attacks on Jewish targets. to occur without a word condemning it. 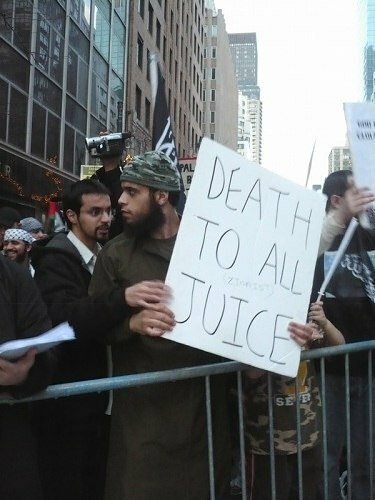 Once, in Europe, Jews finally had enough and took up the sword. American Jews have had enough it seems. They now know that the government will not protect them. They now know that they have to protect themselves. And they are doing just that. 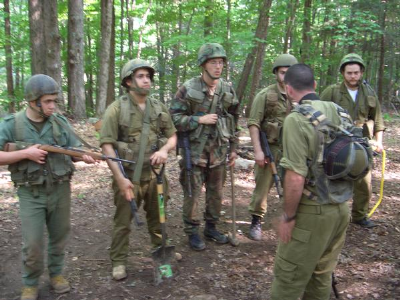 Starting in late July, a group of Israeli combat veterans will be holding a training camp in New York to teach advanced self-defense techniques to Jews in U.S. communities. An increasing number of American Jews have expressed interest in the program following a wave of anti-Semitic incidents worldwide over the past year, organizers report. The group calls itself Kitat Konenut New York – a reference to the “rapid response teams” active throughout Judea and Samaria. Rapid response teams in Israel, comprised of local civilians who are IDF veterans, have often been the first on the scene of terrorist attacks and other emergencies, and have prevented casualties. It was founded in 2006 in response to a shooting attack at a Jewish center in Seattle, Washington. One woman was murdered in the attack, and several others were wounded. The group is apolitical, and does not take part in demonstrations. “Our agenda is to protect Jews,” says group member Yonatan Stern. However, the group does have a firmly held political belief. “We believe in the constitutional right to bear arms,” Stern says. Kitat Konenut encourages all American Jews to learn how to use weapons, and to purchase their own firearms for self-defense. I guess this is the sort of unification and change that we were promised under President Obama. It is more like the return to the regime under that great Muslim hero: Adolph Hitler. 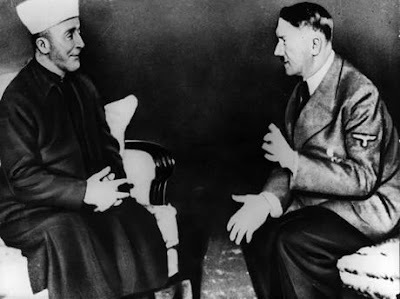 Seen here with his good pal the Grand Mufti of Jerusalem. I suppose that the President just forgot about this bit of Muslim history when he made his historic address in Cairo. Filed under: Anti-Semitism, Israel, United States |	Comments Off on I Never Thought It Would Come To This! You scare me because you have never had military experience, thus don’t understand it at its core. Lou Pritchet is a former vice president of Procter & Gamble whose career at that company spanned 36 years before his retirement in 1989, and he is the author of the 1995 business book, Stop Paddling & Start Rocking the Boat. Mr. Pritchett confirmed that he was indeed the author of the much-circulated “open letter.” “I did write the ‘you scare me’ letter. I sent it to the NY Times but they never acknowledged or published it. However, it hit the internet and according to the ‘experts’ has had over 500,000 hits. It is very unusual for a former intelligence official to come forward and speak about current American policy. So when one did for Northeast Intelligence Network (NIN) I took notice. Haggman told Yonah that this official broke silence because he had already retired from his highly placed position, and because of his knowledge of the NIN’s (Northeast Intelligence Network) position as pro-Israel and the way it valued the relationship between Israel and America. Another reason, he said, was his own perception of the Biblical aspect of this scenario developing. The intelligence officer explained that the turnover of American policy towards Israel could occur through a manner that he dubbed ‘malicious intelligence,” which Haggman defined as information that is taken from its raw form. It then is morphed into something else to promote different interests, “where intelligence and politics meet and often collide,” he said. A method “that has been molded and massaged to advance the agendas of a select few,” he elaborated. U.S. administrations have apparently been following a policy of abandoning Israel for several years, according to Hagmann’s report. His interview with the intelligence official cited “the 2005 surrender of Gush Katif to the Palestinian Authority as one critical example of the slow dismantlement of Israel as a viable nation. Despite critical intelligence outlining in every possible manner imaginable that this would be a disastrous move leading to the events we are seeing today [rocket and missile fire on Israel], it was done anyway,” he stated. In the report that Hagmann posted on the NIN (Northeast Intelligence Network) he cited one of his sources explaining, “Now you can see where intelligence and politics meet and often collide,… ” the Obama administration is being purposely filled with people who are truly anti-Israel, either because of their own financial interests or a larger globalist agenda that does not include Israel, or for that matter, the United States as a sovereign nation. “Whatever the reason, the anti-Israel, pro-Islamist policy makers will be appointed or have already infiltrated nearly all levels of the U.S. government. These are the people who place anti-Semitic references in school textbooks, promote revisionist history regarding Islam, 9/11, and are the same people who allow or even promote the Islamic agendas in all aspects of Western society, especially the restrictions on speech against Islam. “With regard to the latter, note that the United Nations is quite involved in forcing the restriction of “hate speech” and the implementation of global standards, some that have already been adapted by European nations,” noted the source. Hagmann reports that “the Middle East will be the site of ‘the coming war,’ and Israel will be at its epicenter. If we survive as a nation, the U.S. will not be on the side of righteousness in this war, instead turning our back to – or our guns against – our only true friend in the Middle East – Israel,” he said. Before Obama was elected, I warned that he wasn’t a friend of Israel or the Jewish people. He was raised by Muslim father who taught him to hate Jews. He sat at the feet of an avowed anti-Semite for 20 years who called for the destruction of Israel and the Jewish people. His wife was the one who introduced them. But we are not to believe that he is not one. Right! I have a bridge to sell in Brooklyn. Not only is he going to destroy Israel, but he will fulfill the goal of every Muslim in the world. The elimination of all Jews from the face of the Earth. That would have made both his father and step-father very proud! I have been sitting in front of my computer for the last week wondering what the hell is going on with the world. Each day I see more and more evidence of the hatred and bigotry associated with “The Religion of Peace”, and not one elected official or member of the media speak out in horror of what they have seen and heard. Their silence is deafening. I could post hundreds of videos like these, but you get the point. The world does nothing to counter this. And it frightens me. I know this frightens many elder Jews. Men and women who suffered the horrors of the Holocaust. They remember how that started, they remember the songs and chants of hatred, and where it led. The Holocaust didn’t start with Dachau and Auschwitz, it ended there. It didn’t start with World War 2, that war ended it. It started with an idea. That was all. An idea to rid the world of all people who were Jewish. How they did it is a lesson in hate. It happened in 4 stages. It started first with a media campaign. With cartoons and articles depicting Jews as less then human. The Nazis had to win over the hearts and minds of the German people. And it was through the media of the time: Print, radio, and film that they were to accomplish it. A fine example of media manipulation by the Nazis. 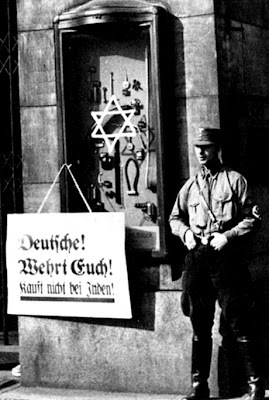 As you can see by the above example, Jews are depicted as lazy and unGerman. Exactly the idea the Nazis wanted to show. 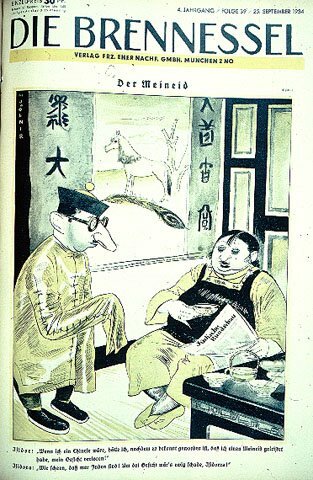 And in today’s media anti-Semitic cartoons are again being shown. Not just in the Muslim world where they are acceptable, but here in the United States and in Europe. This one was printed in many major newspapers in the US, Canada and Europe. Already the media has joined the bigots in their campaign. The print media has already started the process in 1990 and the rest of the media (Conservative radio withstanding) is jumping on the band wagon. It is already to blame Israel and more importantly Jews for all the evils in the world. That is the message the majority of people in the West are hearing day and night from the media. It is becoming their mantra, their motto. And the majority of people in the West are like sheep. They are easily led and manipulated. Stage 1 is well underway. On to Stage 2. Stage 2 is the “People’s Uprising” part of the operation. In this supposed average citizens (and in the case of German: Brownshirts) take to the streets in protests. These protests get more and more violent over the weeks, months or years, culminating in the ultimate protest of all: The Riot (in Germany Kristallnacht). Again we are seeing the middle part of Stage 2. So-called “citizen protests” in every major city in the world. Many are turning violent. In London and Paris there have been riots. This is just the beginning. The protests all over the world will get more and more violent and will be attacking more and more Israeli and Jewish businesses and people. Governments will have to cave into the demands of the rioters in order to have peace. There is just one problem. Their demands lead directly to Stages 3 and 4. By this time the government is able to start their “Final Solution” without any subterfuge. They will eliminate the rabble crowd from public view (In Germany Hitler destroyed the Brownshirts) and can operated openly with public support in many cases. The government will begin the round up of their Jewish population to place them in safe areas. This now can be done openly and with great fanfare if the government wishes. The people will be placed in special areas with a city (as in the Warsaw Ghetto) or special areas in their nation (as in various Indian Reservations or Japanese Interment Camps). If people complain about it, they either mysteriously disappear or are brought up on false charges. If a group starts to complain about what is happening, they are reminded that these people are being relocated for their own protection. The round up of Dutch Jews. The majority population either doesn’t care or is openly supportive of the action being taken. Sometimes governments stop here. They either do not have the immorality in them to take the last step, or enough public outcry stops them from taking the last step. It is a very small step to go from the rounding up of people to the mass execution of people. A very small step. This step is normally done without the public’s knowledge and with a total or almost total media blackout. For if the general public ever found out about the slaughter of innocent people, they would be so horrified that they might not be easily controlled by the government. 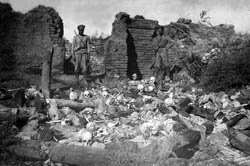 In Turkey the government rounded up millions of Armenians and slaughtered them by shootings, starvation, and illness. In Germany at the start of the Holocaust, the Germans had a 2-fold idea. Starvation and mobile killing units (Einsatzgruppen). This units would dig a big ditch or pit, have the Jews rounded up, many times they would force the people to strip, then line the up and shoot them. At Babi Yar more than 34,000 men, women and children were murdered over a 2 day period. But that was too inefficient and slow. The final step in the perfect genocide is the creation of “special death camps”. Places where the only object is to kill your fellow man. The names of Auschwitz, Treblinka, Sobibór, Bełżec, Chełmno, and Majdanek jump out at you. They speak of untold horror and death. They are the end result in what started with Stage 1. 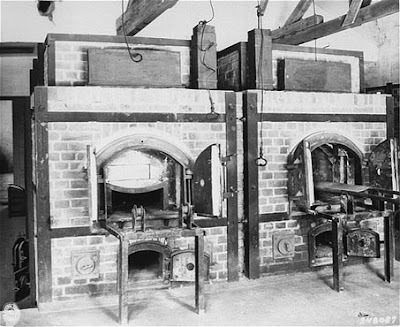 Two ovens inside the crematorium at the Dachau concentration camp. Dachau, Germany, July 1, 1945. Already we are seeing the first 2 stages of the road to genocide being played out in the world. There is the media accepting as truth the propaganda and lies coming from the Muslim world, accepting without any questions. And there is the “People’s Uprisings” being played all over the world. Already Stage 2 is progressing to riots and beatings. If left unchecked these riots will become worse and there will be murders associated with them. And what do we have to combat it? Very little. We have bloggers who try and spread the truth about what is happening. We have a few conservative speakers on the radio trying to spread the truth. But we have mostly silence. Silence from elected officials too scared of those who are rioting to anger them further and silence from the media, too afraid of losing their viewers. And thus has begun. I know many voices on the right who claim that this cannot happen again, that they will not allow it. But how many of them would actually lay down their lives to prevent it? It is one thing to say you will not allow it, but another to actually have to take a stand and prevent it. I pray that this time the good men and women will do something to stop it. And The World Turns A Blind Eye. In the 1930’s the world turned a blind eye on to what Hitler’s Germany was doing to its Jewish population. Anti-semitism was acceptable in all nations, and the majority of people in most nations wished they could do the same. 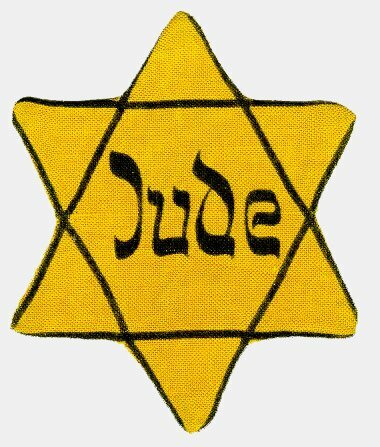 Then came the Holocaust and the world was shamed into a more civilized manner. Anti-semitism was the venue for the fridge on the very far right, the neo-Nazis, the Skinheads, the KKK. For it has raised its ugly head. Not only in Muslim nations where it is state policy, but in every nation in Europe, Canada and now the United States. Outside of Israel, there is no nation in this world that a Jew is truly safe. Assailants rammed a burning car into the gates of a synagogue in Toulouse, in southwest France, Monday night. A Jewish congregation in Helsingborg, in southern Sweden, was attacked Monday night by someone who “broke a window and threw in something that was burning,” said police spokesman Leif Nilsson. And on Sunday slogans, including “murderers … You broke the cease-fire,” were daubed on Israel’s Embassy in Stockholm. In Denmark, a 27-year-old Dane born in Lebanon to Palestinian parents is alleged to have injured two young Israelis last week in a shooting police suspect could be linked to the Gaza crisis. Belgium ordered police in Antwerp and Brussels to be on increased state of alert” Tuesday after recent pro-Palestinian protests ended in violence and arrests. Jews in the small Strasbourg suburb of Lingolsheim in eastern France woke up Tuesday to find graffiti with words like “assassins” spray-painted on the outside walls of their synagogue. The community filed a complaint for “degradation of a place of worship,” the mayor’s office said. Not being satisfied with just protesting, the anti-Semities are turning to looting after their “peaceful” protests. The number of anti-Semitic attacks in London has risen sharply following Israel’s land assault on Gaza, Jewish community groups said today. Their leaders have compiled a dossier of attacks against Jews which will be handed to seniors officers in the Metropolitan police. An attempt to burn down a synagogue in north-west London. An assault on a Jewish motorist who was pulled from his car and punched. A gang of youths chanting anti-Semitic slogans as they tried to enter restaurants and shops in Golders Green. 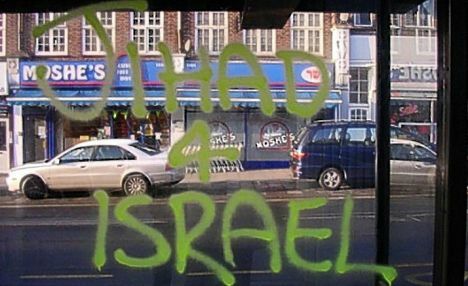 The Community Security Trust, which is responsible for the safety of Jews in Britain, has also noted the emergence of anti-Semitic graffiti in Jewish areas across London. The trust has now logged 24 anti-Semitic incidents – most of them in London – in the past week. Police are said to be stepping up patrols in Jewish areas. On New Year’s Eve, a man was pulled from his car just as he was about to drive off and assaulted by three men whom he described as being of Arab appearance. The victim did not suffer any serious injury. 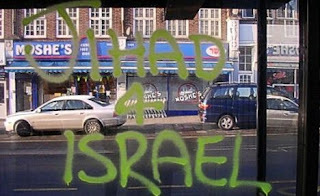 The same night a gang of youths alarmed locals in Golders Green by trying to enter Jewish shops while chanting anti-Israeli slogans. Joey Ben-Yoav, manager of nearby Met Su Yan, a kosher Chinese restaurant in Golders Green, said: “It was scary. They were waving flags and shouting. It felt like if we went out they would hit us or something. But I have come to expect that from Great Britain now. They are practically a Muslim nation with the implementation of Shar’ia Law, and no-go areas for Muslims only. A memorial monument to prime minister Yitzhak Rabin in Wellington, New Zealand was defaced with red paint during a demonstration on Monday against the IDF operation in Gaza. According to Web site Stuff.co.nz, about 100 protesters converged at the monument in Lambton Quay, where Wellington Palestinian Group spokesman Don Carson criticized the lack of New Zealand government response, calling it weak and one-sided, and urged it to enter talks with Hamas. “Let’s send a message to our politicians to damn well do something,” he said. One of the demonstrators, Father Gerard Burn, then sprinkled red paint, mixed with a drop of his own blood, on the monument to mark the killing of hundreds of Palestinians and the seizure of their land. Members of the crowd chanted “They kill, they lie but Palestine will never die”, “Allahu Akhbar” and “Free, free Palestine”. I see the Catholic Church is back up to its usual anti-Semitic behavior. The old Kill the Jews chant will probably be standard in Father Burn’s church every Sunday now. Ontario’s largest university workers’ union is proposing a ban on Israeli academics teaching in the province’s universities, in a move that echoes previous attempts to boycott goods and services from the Jewish state. The resolution, proposed by CUPE’s Ontario University Workers Coordinating Committee, is in protest against a Dec. 29 bombing that damaged the Islamic University in Gaza. “In response to an appeal from the Palestinian Federation of Unions of University Professors and Employees, we are ready to say Israeli academics should not be on our campuses unless they explicitly condemn the university bombing and the assault on Gaza in general,” said Sid Ryan, president of CUPE Ontario. The resolution is still being drafted but the union said it will seek to prohibit Israeli academics from speaking, teaching or researching at Ontario universities. The CUPE committee will distribute the resolution to its members at the end of the month. It will be put to a vote at the committee’s annual conference in February. Why does this not surprise me? Canada which prides itself on civil behavior has turned into a haven for hatemongers and anti-Semites. A bottle of flammable liquid was hurled at one of Chicago’s oldest synagogues, catching fire but not causing major damage. No one was injured in the incident early Monday at Temple Sholom of Chicago. Chicago police and the Chicago fire department are investigating the arson as a hate crime. No one was in custody Monday. Roger Rudich, president of the temple, says the arson was unsettling but not damaging. Rallies in Anaheim, New York, Chicago, San Francisco, and other US cities. No more demos. No more signs, chants, pithy t shirts. No more marches to nowhere. And DEFINITELY no more emails to Congress, or heart-felt messages to Change.Gov and Obama, begging the conspirators to stop the conspiracy. We each one of us is responsible – and we each one of us must take action. We cannot rely on Others to do it for us. Here is an excellent article, with a detailed list of actions we can take, from James Petras. I have strongly suggested to many different so-called action groups, that we immediately institute a program of visits to every synagogue in the USA, on Friday evenings and Saturday mornings, and rise in each congregation and – in dignified firm and unemotional voices – repeat “STOP THE KILLING”– We need to go in groups of 3-4, to insure that we have 1 person as a defensive shield, and one as a video camera witness, recording everything. Jews especially should be doing these actions. We will face harsh treatment, and possibly physical attack, but our message must be resolute and continue week after week. I see no possible legal impediment to this. The public, and certainly Jews- cannot be barred from entry to the services, and it will be extremely hard for the Synagogues to enforce exclusion. If they do, we can speak on the front steps, on the street, in the parking lot. The Jews of America must be confronted with their clear responsibility- far more than complicity-in the mass murders, occupation, and forced starvation of the people of Palestine. And the MSM sees none of this, doesn’t report any of this, turns a blind eye. In 1933 the world turned a blind eye when Germany slid down the slippery slope that led to the Holocaust. 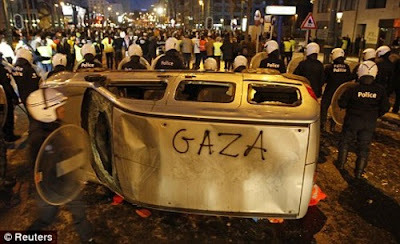 In 2009 the world is again turning a blind eye to anti-Semitism in their own lands. The media is giving approval for the rhetoric, the violence. The police half-heartedly investigate, and the politicians in each nation say nothing, do nothing to stop it. And Jews around the world pray for this cycle to end. But fueled by groups like CAIR, it will only get worse. Filed under: Anti-Semitism, Canada, Europe, Muslims, United States |	Comments Off on And The World Turns A Blind Eye.